be fruitful and multiply came from a personal exploration of the heritage of my family and community. Historically, Jewish immigrants started out at the bottom of the textile industry, selling rags just to survive. Over time, this evolved into myriad successful businesses. This transition — from insecure subsistence to absolute abundance — has become a cycle. The rise of fast fashion and uninhibited consumerism has given rise to a new form of insecurity. Our culture has become so fruitful, has multiplied so excessively, that we’re now depleting the planet’s resources. Each panel reflects a different understanding of this narrative. In one, the fabrics are rich, plush, and luxurious; they are markers of wealth. The way they drape over edges and spill out beyond the frame symbolize excess. The embroidered silk brocade at the top is supporting this vision of prosperity, but openness of the following rows suggest that it can’t last forever. In the next, white rope stretches a densely knit center almost to its limit. 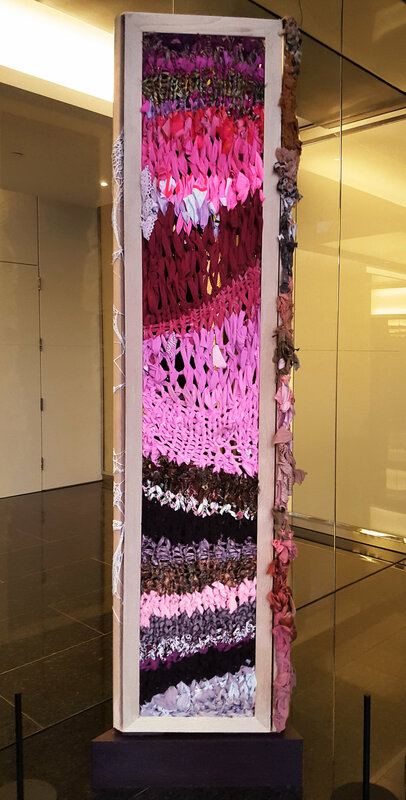 The purple figure in the center is bound into an exquisite contortion that feels dangerous and beautiful at the same time; it honors the tension of economic insecurity without ignoring the beauty in survival. The last panel is a nod to landscape painting. The bands of color evoke the lines of a horizon and ask us to consider the ways in which our excessive consumption affect the earth. 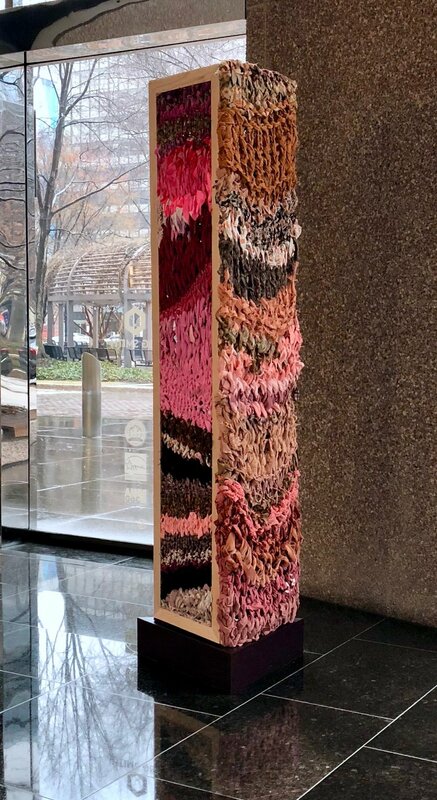 be fruitful and multiply is currently installed in crystal city, arlington, VIRGINIA.